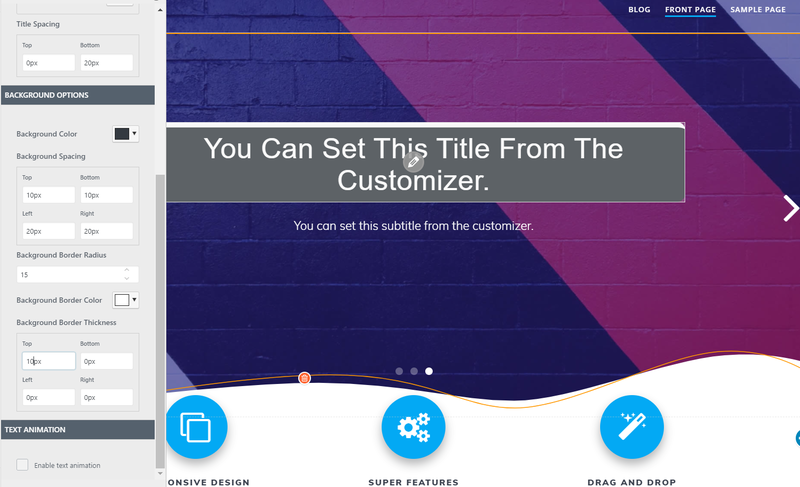 In the customizer, go to Hero -> Front Page Hero, then select Slider. 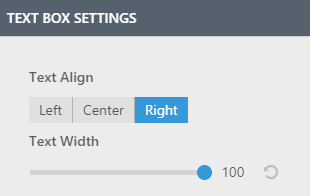 For adjustment of the text box settings, go to the corresponding section titled “Text Box Settings”. Click on this title. A panel will open, with the configuration options. The text in the text box can be placed to the left, on the center or to the right. Text width refers to the horizontal distance occupied by the text in the text box. The width can be set to larger or smaller, on a scale from 0 to 100. Dedicated background options for the text box are available in every slide. To adjust these settings, you should first apply a color to the text box background. Next, you can adjust the distance of the text from the top, to the bottom, from the left and to the right, in the text box. This option refers to the bending angle of the text box background. It is noticeable when the text box background is set to color. You can apply a border color to the text box. It will be visible only if you have previously set a certain thickness for the text box background border. The thickness of the border (top, bottom, left and right) should be expressed in pixels. It will better emphasize the text in the text box. From this section, you can adjust the settings for the title you want to include in the slide. Click on “Options” and a panel will open with the customization features. You can include text animations. For more details about text animations, please read this article. From this section, you can adjust the settings for the subtitle you want to include in the slide. From this section, you can adjust the settings for the motto you want to include in the slide. From this section, you can include buttons for the slide you are customizing. Click on “Options” and a panel will open with the customization options. For more details about customization of the buttons, please read this article.